Wutai is the long, thin continent in the north-west on your map. 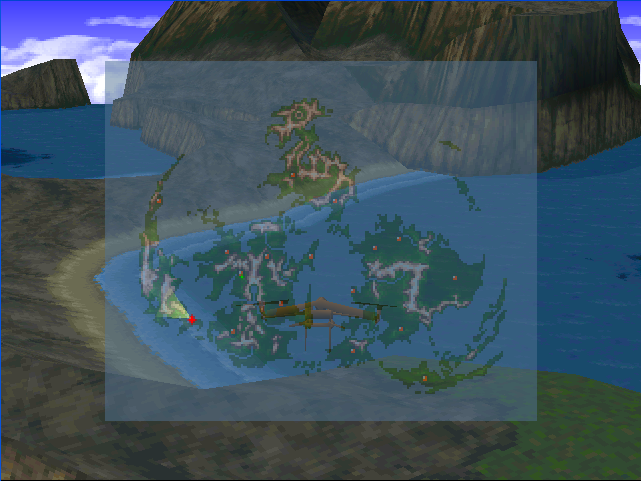 The city at the northern tip provided the force opposing Shinra during the much-alluded-to war in which Sephiroth fought, long before the start of the game. Since its defeat, the economy of the once proud nation has been struggling, having to increasingly rely on tourism to bring in the Gil. Though it's not essential to visit Wutai during the game, you can take part in a couple of interesting diversions. Reaching the city is easy if you happen to have use of an airship — just land on the ground nearby. If you're coming from the sea, you'll need to land on the beach in the south of the continent and take a long walk over the mountains and bridges to get there. Along the way, you might encounter the Bizarre Bug, Thunderbird, Tail Vault and Adamantaimai enemies. Even if you have an airship, you should take this route if you're going to play the Materia Thief quest, as it begins during this journey. You can go straight to the city for the Pagoda quest, but you should complete Materia Thief first. If you can't traverse the seas yet, you'll have to come back later. Yuffie must be in your active party. You can not have reached Disc 3. The sidequest involves fighting one boss and going through a challenging hour or so without any materia. You also get a few good items that you wouldn't otherwise get (see below). It also gives a lot of backstory for Yuffie, this area, and the effects of the war, and involves an interesting encounter with the Turks. Finally, by doing this sidequest, you can come back later and do the Pagoda sidequest which gives you another summon materia, Leviathan and a chance to really level up Yuffie. In addition to the enemies listed in the introduction to the continent, you'll also run into Jayjujayme, Bizarre Bug, and Rapps on the mountain, and Attack Squad at various points. Once you're on the continent, walk northwards, and if you have Yuffie, you'll have a little encounter that leaves a bad taste in your mouth; she's stolen your materia. You'll need to go far north to Wutai to get it back. Something clever of note: If you're playing this sidequest late in Disc 2, you may notice that she has not stolen all of your materia. Yuffie only takes off with 60 materia, seemingly the 60 most recently acquired. When you get into the town, you'll see her sneak off to the left. Go into the shop there and talk to the owners. If you keep going left, you'll see that the Turks are in the bar the Turtle's Paradise, on vacation, having a drink. Elena, however, is tense and wants to get back to work. Go up and around to the weapon's shop, where you can get an MP Absorb materia from a chest. Yuffie promptly sneaks up from you and steals it. Go back to the first house that you see in Wutai, with the senile man, and check the unfolded screen that was previously folded. Yuffie looks up guiltily, then runs out. Next, head to the pub where you saw the Turks, and check the large, white, shaking pot outside. After she's caught, you see a small scene with the Turks. She gives you a short, sad story for an explanation, which is true enough. When she's done, you have an option, but it doesn't matter which you pick; you'll have the same fate. Once you're done with Yuffie here, be sure to look at the poster for Turtle's Paradise that's lit up, in the hall outside the big purple mat, and examine it. Leave the house, and go back to the save point then head left to the other part of town. If you go in the gondola, you can hit a lever to make a door open beneath it. Inside, you see that Yuffie's been captured, and then the unmistakable laugh of Don Corneo is heard. He also managed to get the better of Elena, somehow. To your right, there's a chest with a Swift Bolt, and to the left there's one with an Elixir. Follow them up the stairs, and you'll soon have a fight. Head down, and you're in someone's house. In the second room, you can barely see the outline of a door, on the bottom. Go through that to get to the hallway on the other side, and head right through another door. At the end, there's a chest with a Hairpin in it. You can get free rest further down, in the top room, and go under a wall hanging to the left side of that room to another hall. There's a chest at the end of that one, with a Magic Shuriken. Once you're done, leave and you'll see the Turks running away, back to the other part of town (minus Elena). You now have a temporary truce with them, so head down when you're ready. When Reno says the place that stands out the most, by the way, he doesn't mean the big pagoda; he means the mountain. Head back to the other part of town, do some shopping, level up if you feel you need to. Since Aeris has a curative limit break, it's best to have her well-leveled, since you'll have a boss battle soon and will need healing as much as possible. You'll also want to buy some attack items from the one shop that will sell you things. Head up over that bridge, into the mountain area. The first right, then the right after that, takes you to Reno. Go back, then up and around. Head up to Rude, then into that cave he dashed into. Here you can get a Dragoon Lance from a green chest. Head down and to the left, and then your search is over. Well, almost. This boss is really tough, so be ready. Have your high-HP people in your party, and it also helps to have Aeris, for her curative limit break. Use items that do damage, like Swift Bolt, Fire Veil and Fire Fang; heal often. The best way to go is to heal someone every second or third turn, and hit him as hard as you can. If someone is downed, bring them back up as soon as possible. After the battle is over, Don asks you a question. Answer whatever you wish; it's the same outcome either way. At the end, Yuffie puts your materia all back. But you'll have to re-arrange it, as she's messed up the positioning. She does at least give the MP Absorb materia back, though, and now you can go to the shops. Remember that little shack with all the cats, near Yuffie's house? Go in there, and now you can up the stairs and get to a chest with an HP Absorb materia. That's it for this sidequest; you go straight onto the Pagoda sidequest, or come back and do it later. Once you've completed the first Wutai sidequest, you may go on with this second one at any time, even right after you finish the first. Bear in mind, though, that if you're playing for completism, the only way to get the Trine enemy skill on all four of the game's Enemy Skill materia is to save this sidequest until after you have them. The great tower you see standing at the north end of the city is where you'll want to head, but first make sure that you outrig Yuffie with all the best materia and equipment. Strip your other characters of armor and materia if you have to, just make sure she has all the absolute best stuff on her. You'll thank yourself later on. As a sidenote, if you haven't already, go out fighting around the Wutai beach area where you can encounter the Adamantaimai, a huge tortoise that's not really much of a challenge if your levels are high enough or you've got good magic defense. The point of interest here is that you can steal Adaman Bangles from it, which give you an extremely high physical defense rating while trading off some magic defense. You can also learn the Enemy Skill Death Force from it. An Adaman Bangle can be very useful to some of the bosses you'll face. Recommended equipment by this author would be: Magic Shuriken*, Adaman Bangle, Jem Ring. * Refer to the Wutai Part 1 miniguide for information on how to get one for free while you're here. ** Additional recommendations tailored for each boss are described in their appropriate sections. When you're ready, enter the tower with Yuffie in your party and prepare to run the gauntlet, because you'll have to face five trials to gain the power of the Water God. Checking your equipment one last time before going in might be a good idea, and remember to heal in between every battle so you'll be in top shape for the next. Being past level 20 sure doesn't hurt, either, and having the Beta Enemy Skill (which you learn from the Midgar Zolom) would be a great help, too, since it's one of the game's stronger enemy skills! Equipping Yuffie with a Elemental/ Gravity combination helps, as does having Cure, Haste, and Counter Attack. When the fight starts, cast Haste and Barrier if you have them (or if you're that advanced, Wall) and start wailing away on him. Keep curing and laying into him with your strongest attacks, and he'll soon run out of skill points, where it'll then come down to who can outlast the other. For winning, you get a nice little X-Potion. Now Shake is a really fast enemy for the earliest point of the game you can find him, so Haste is more important than before. Just like the last Pagoda battle, throw up Barrier and Haste and just pummel away with your strongest attacks, keeping your HP up as you go. You can also remove that Elemental/ Gravity combination, since Demi won't help you much anymore. Summoning Choco/Mog might paralyze him for a while, making the battle easier, too. She's not so tough, really. Equipping a Jem Ring will keep you from being paralyzed by her Stare Down attack and make your life a lot easier. Start with a dose of Barrier and Haste, and since she moves so slow, it'll be that much easier. Anything goes as far as attacks, too, so just unload everything on her and watch her fall. Even easier than the other battles in the Pagoda. Throw up Barrier and Haste as in the previous Pagoda encounters, and just pummel away at him with your physical attacks (magic isn't even needed here). Barrier cuts down his damage so much that it'll start to be irrelevant, and provided you're strong enough physically, this fight should be a breeze. Of all the Pagoda battles, Godo is by far the toughest boss. He has three faces, each with its own attacks and attack turn, so it's going to be very possible that he could get two or even three attacks in to your one. As usual for the Pagoda, throw up Barrier and Haste, which will help a lot. If you have Regen, use it ASAP so you can recover your HP as the battle rages. Fire 2 and better is a big help here, in addition to your limit breaks (for heaven's sake, use them as soon as you can!) He's also vulnerable to poisoning, and an Added Effect/ Poison combination can be most useful. When the battle gets going in earnest, keep your Barrier up and keep healing her, and watch out for his Frog and Mini attacks, attacking when you can with your strongest stuff. He's also vulnerable to Slow, so casting that can make your fight easier. Just hang tight and stay with him as long as you can. Should you win (you might not be able to if you're too weak), you'll be awarded with the power of the Water God, Leviathan, and given the item that grants Yuffie's ultimate Limit Break, All Creation. After that, you only have to collect yourself and rearrange your materia and equipment, then start working on upping Yuffie's levels so she can use her new toy.